Morecambe picked up a vital point at bottom club Notts County to end a fine week with seven points from nine. 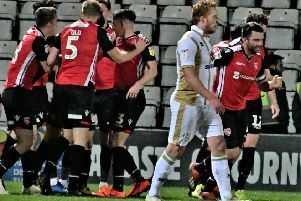 In a game that was more perspiration than inspiration the Shrimps showed their battling qualities to keep their second clean sheet in three games. It also maintained their nine-point advantage over a Notts County side battling to hang on to their Football League status. Jim Bentley’s side did not reach the heights of Forest Green and MK Dons in terms of going forward, but on this occasion their defence excelled and when they were beaten, Mark Halstead stood tall with a superb double save. The game started in a frantic fashion with some tough early challenges from both sides that led referee Kevin Johnson to show an early card to Morecambe’s Richie Bennett for a late challenge on Stubbs. The Magpies provided the early pressure, with Richard Duffy volleying a Michael Doyle corner across goal and wide. Former Shrimps’ star Lewis Alessandra followed up shortly afterwards with a sliced effort from just outside the area, following Luke Conlan’s skewed header but the ball flew well wide. Former Blackpool midfielder David Vaughan then sent a low, left-footed effort wide from 25 yards, before the Magpies’ best chance of the first half when Enzio Boldewijn latched on to Matt Tootle’s clipped pass into the channel, drilling the ball low into the middle only for Alessandra to be denied a free shot on goal by Zak Mills’ superb covering block. 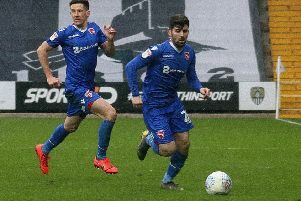 Morecambe’s response came from Bennett, who delivered a superb left-wing cross into the six-yard box which was just too far ahead of Aaron Collins at the back post but he arrived just too late to connect with the ball. The Shrimps could have taken a 1-0 lead into the break after Alex Kenyon picked out Steven Old unmarked in the middle with a pinpoint cross, but the defender could only head over the bar. The second half began in scrappy style with Mitchell Rose being booked for a foul on the evergreen Kevin Ellison. Collins bobbled a shot straight at Schofield before Tootle responded with a 25-yard volley that flew over. Notts went much closer to taking the lead moments later as Halstead made a great double save. Vaughan won possession high up the field before playing Boldewijn through one-on-one with Halstead but the keeper got down low to parry the ball out to Rose 20 yards from goal and the former Grimsby man’s follow up was also saved. As the game drew to a close, Collins forced Ryan Schofield into a smart save low to his left with a shot from distance. The Magpies piled forward at the death but the Shrimps defended superbly with some fine blocks from Ritchie Sutton and Kenyon to secure a fine point. Notts County: Schofield, Tootle, Duffy, Stubbs, Mills, Vaughan (Patching 83), Doyle, Rose, Alessandra(Mackail-Smith 75), Boldewijn, Hemmings. Subs (not used): Fiztsimons, Bird, Barclay, Gomis, Dunn. Morecambe: Halstead, Mills, Old, Sutton, Conlan, Mingoia, Cranston (Fleming 70), Kenyon, Ellison, Collins, Bennett (Mandeville 83). Subs (not used): Roche, Dalby, Mendes-Gomes, Brownsword, McKay.